The Lenovo-owned brand Moto’s G6 Series is launching this week. The series includes 3 handsets, Moto G6, Moto G6 Plus and Moto G6 Play. The information related to these smartphones is constantly leaking. Now a new set of information of the Moto G6 Play has been leaked ahead of the April 19 launch which includes pictures showing the design and specification of the handset. Another leak has revealed that the smartphone can come in Black, Gold, Indigo, Rose Gold and Silver colours. According to the picture, 3GB RAM has been given in the handset. Also, the user can get the 4000 mAh battery in Moto G6 Play. The phone will also feature Moto Turbo Power Fast Charger. Talking about the camera, the smartphone reported being having a 13-megapixel back camera. The front camera will have an 8-megapixel sensor. In the leaked photo, the LED flash is visible with both cameras. Fingerprint sensor can also be given in the back of the smartphone. Keep in mind, a recently leaked video hinted the HD Plus Max Vision display in the Moto G6 Play. 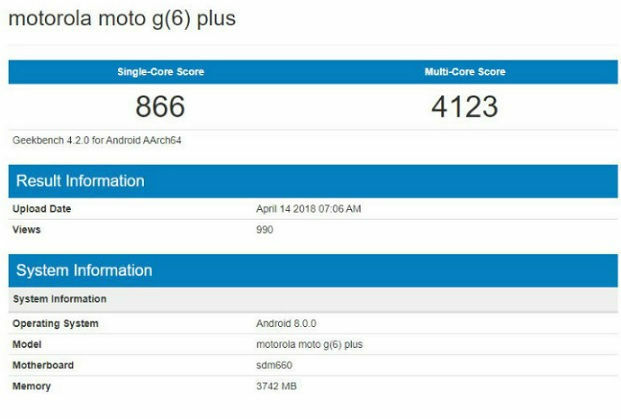 It also pointed that there will be the duo of Snapdragon 427 processor and Adreno 308 GPU. However, we’ve to wait for the official launch of the Moto G6 Series to see what these handsets have to offer. Till then stay tuned, we’ll be updating you with the latest news on the launch. Previous articleReview of Vivo V9: Is it Worth Buying?